The Universal Robina Sugar Milling Corporation (URSUMCO), a sugar division of Universal Robina Corporation (URC), is a raw sugar mill and refinery plant with main office at Suite 2201, Robinsons Equitable Tower, No. 1 ADB Avenue corner Poveda Street, Ortigas Center, Pasig City and plant site Alangilanan, Manjuyod, Negros Oriental. The raw sugar mill was constructed in 1975 and was originally owned by a group of sugar planters in the district. It was originally named as United Planters Sugar Milling Company (UPSUMCO). The plant acquired by Universal Robina Corporation in 1988, hence its new name. The raw sugar mill has an original milling capacity of 4,000 tons cane per day and was expanded to 8000 tons can per day to be able to meet the increase in cane production of the district. The Refinery Plant was designed after the British Tate & Lyle Process Technology particularly employing the Ion Exchange Resins-Phosphatation Process of sugar refining. The plant was constructed in 1993 and commenced formal operation in 1996. It has a refining capacity of 10,000 bags refined sugar per day. Most of the time the plant operates simultaneously with the Raw Sugar Mill for economic considerations taking advantage of the common/dual utilization of steam and electric power generated by the existing Raw Sugar Mill Steam and Power Plant. The principal finished goods produced are raw and refined sugar. Most of the raw sugar produced is directly processed as refined sugar and the remaining raw sugar is stored in the sugar warehouse in bulk or 50 kg/bag. 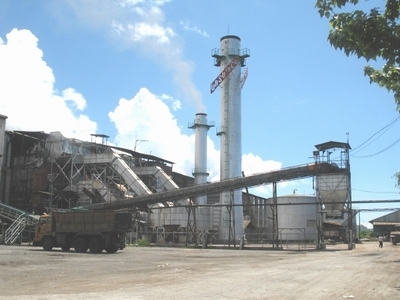 The final molasses, a by-product in the sugar manufacturing process, is stored in the molasses tank at the plant site or in off shore at the Campuyo Pier which is also owned by the company. The sugar cane milled is owned by the planters and delivered to the mill by the trucks owned or hired by the planters. To assist the planters in hauling the canes to the mill, the company provides subsidized hauling in the form of company-owned cargo trucks. Sugar and molasses manufactured from the sugarcane is shared by the Mill and the Planter (owner of canes) in accordance with a pre-established sharing scheme.